UPDATED: Thu., May 10, 2018, 7:55 a.m.
BEIRUT – The Israeli military on Thursday said it attacked nearly all of Iran’s military installations in neighboring Syria in response to an Iranian rocket barrage on Israeli positions in the occupied Golan Heights, in the most serious military confrontation between the two bitter enemies to date. Israel said the targets of the strikes, its largest in Syria since the 1973 war, included weapons storage, logistics sites and intelligence centers used by elite Iranian forces in Syria. It also said it destroyed several Syrian air-defense systems after coming under heavy fire and that none of its warplanes were hit. Iranian media described the attacks as “unprecedented,” but there was no official Iranian comment on Israel’s claims. The White House condemned Iran’s “provocative rocket attacks from Syria against Israeli citizens” and expressed strong support for “Israel’s right to act in self-defense,” while Russia said the Israeli strikes marked a dangerous escalation, urging both Israel and Iran to avoid provoking each other. Israel has acknowledged carrying out over 100 airstrikes in neighboring Syria since the civil war erupted in 2011, most believed to be aimed at suspected Iranian weapons shipments bound for the Hezbollah militant group. But in the past few weeks, Israel has shifted to a more direct and public confrontation with Iran, striking at Iranian bases, weapons depots and rocket launchers across Syria, and killing Iranian troops. Israel accuses Tehran of seeking to establish a foothold on its doorstep. Iran has vowed to retaliate. Reflecting the scope of the overnight attacks, Russia’s military said 28 Israeli jets were involved, striking at several Iranian and government sites in Syria with 70 missiles. It said half of the missiles were shot down. Speaking at the Herzliya Conference, an annual security gathering north of Tel Aviv, Defense Minister Avigdor Lieberman said Israel would response fiercely to any further Iranian actions. The Britain-based Syrian Observatory for Human Rights, which closely monitors the civil war through sources inside Syria, said the overnight Israeli attacks struck several military posts for Syrian troops and Iranian-backed militias near the capital, Damascus, in central Syria and in southern Syria. The Observatory said the attacks killed 23 fighters, including five Syrian soldiers. It said it was not immediately clear if Iranians were among those killed. The Syrian military said the Israeli strikes killed three people and wounded two, without saying if any Iranians or Iran-backed militiamen were among them. It said the strikes destroyed a radar station and an ammunition warehouse, and damaged a number of air defense units. The military said air defense systems intercepted “the large part” of the incoming Israeli strikes. An Iranian state television presenter announced the Israeli strikes, sourcing the information to Syria’s state-run SANA news agency. The broadcaster described the Israeli attack as “unprecedented” since the 1967 Mideast war. Israel captured the Golan Heights in the 1967 war, annexing it in 1981 in a move not recognized internationally. In 1974, Israel and Syria reached a cease-fire and a disengagement deal that froze the conflict lines with the plateau in Israeli hands. Damascus shook with sounds of explosions just before dawn, and firing by Syrian air defenses over the city was heard for more than five hours. Syria’s state news agency SANA said Israeli missiles hit air defense positions, radar stations and a weapons warehouse, but claimed most incoming rockets were intercepted. Russia sent forces to Syria to back President Bashar Assad in 2015. But Israel and Russia have maintained close communications to prevent their air forces from coming into conflict. Israeli Prime Minister Benjamin Netanyahu traveled to Moscow on Wednesday to meet with President Vladimir Putin and discuss military coordination in Syria. Britain condemned “in the strongest terms” the alleged Iranian rocket attack against Israeli positions, while German Chancellor Angela Merkel and French President Emmanuel Macron called for de-escalation and “level-headedness” in the region. Israel said early Thursday that Iran’s Quds Force fired 20 rockets at Israeli front-line military positions in the Golan Heights. Lt. Col. Jonathan Conricus, a military spokesman, said four of the rockets were intercepted, while the others fell short of their targets. 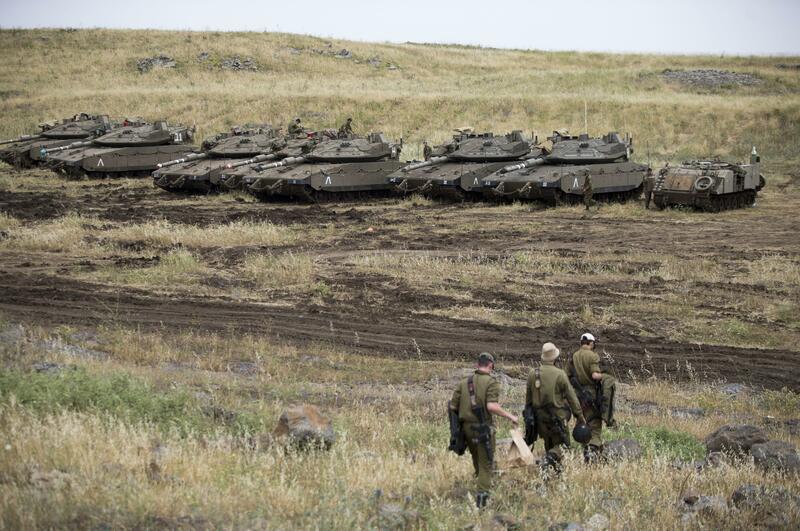 The incoming attack set off air raid sirens in the Golan. It is believed to be the first time in decades that such firepower from Syria has been directed at Israeli forces in the Golan Heights. Iran’s ability to hit back further could be limited. Its resources in Syria pale in comparison to the high-tech Israeli military and it could also be wary of military entanglement at a time when it is trying to salvage the international nuclear deal. Iran has sent thousands of troops to back Assad, and Israel fears that as the fighting nears an end, Iran and tens of thousands of Shiite militiamen will turn their focus to Israel. Earlier this week, Syrian state media said Israel struck a military outpost near Damascus. The Observatory said the missiles targeted depots and rocket launchers that likely belonged to Iran’s elite Revolutionary Guard, killing at least 15 people, eight of them Iranians. Last month, an attack on Syria’s T4 air base in the central Homs province killed seven Iranian military personnel. On April 30, Israel was said to have struck government outposts in northern Syria, killing more than a dozen pro-government fighters, many of them Iranians. But Thursday was the first time Israel openly acknowledged targeting Iran. Published: May 10, 2018, 6:33 a.m. Updated: May 10, 2018, 7:55 a.m.